ACT 1 -- Rigoletto is the Duke of Mantuas jester. The Duke is a sensual libertine, and Rigoletto abets him in his evil purposes. He assists him to debauch the wives of Count Ceprano and Count Monterone, the latter of whom utters a terrible malediction against him which fills Rigoletto with a fearful foreboding. Rigoletto has a daughter, the beautiful Gilda. Gilda, so far as he can order it, shall never be contaminated by the pernicious influence of the Court. So, to that end, he immures her in an out-of-the-way part of the city. But the Duke discovers her retreat, wins her affections in the disguise of a student, and arranges for her forcible abduction and transference to the Palace. ACT 2 -- When Rigoletto discovers his daughter there, he is horrified -- horrified especially to find that she loves the Duke. He vows vengeance against Gildas seducer, and hires a desperado named Sparafucile to assassinate him. Sparafucile is the proprietor of a lonely wayside inn; and he engages his sister, Maddalena, who acts as a decoy for victims, and is herself enamoured of the handsome Duke, to lure him to the hostelry. ACT 3 -- The Duke arrives at the inn, and makes love to Maddalena, singing the familiar "La donna e mobile." Meanwhile, Rigoletto has been persuading Gilda to rig herself out as a cavalier, with the object of escaping from the Palace. But before she flies, he sends her to the door of the inn that she may prove for herself the Dukes faithlessness. Maddalena has fallen more than ever in love with the Duke, and, making an appeal to her brother, gets him to promise that he will spare the Dukes life on condition that he may kill the first person who enters the inn. For Sparafucile had bound himself to bring the Dukes body in a sack to Rigoletto before claiming his reward. Gilda, overhearing the discussion in the inn, and still infatuated with the Duke, resolves to save his life. She knocks for admittance, and is promptly stabbed by Sparafucile. Rigoletto, coming for the supposed victims body, opens the sack, discovers his daughter, and falls senseless upon her. The opera ends with the prostration of Rigoletto, whose dreaded forebodings of Count Monterones terrible curse are thus literally realised. As regards the music, "Rigoletto" marked an immense progress in Verdis style. The instrumentation is far less noisy than in former works, and has more significance than a mere accompaniment. There are brilliant touches of dramatic power, particularly in the last Act. The vocal score contains many effective passages, such as Rigolettos wrath at the stratagem of the courtiers in abducting his daughter; Gildas love-song, "Caro Nome"; and the Dukes gay and lightsome aria, "La donna e mobile," so full of elegant ease, and so striking in rhythm. The magificent quartet, "Un di, si ben rammento mi," sung by Rigoletto, Gilda, the Duke, and Maddalena, is often remarked upon by critics as combining the most diverse emotions into a powerful ensemble. Even today it is a model of concerted writing. Here, and in other places, Verdi reached a level of art which he had never before attained, and which, indeed, he did not touch again until twenty years later in "Aida." Written and instrumented, under the prompting of managerial necessity, in forty days, "Rigoletto" was first produced at Venice on March 11, 1851. Like "Faust" and "Carmen," it did not take the fancy of the public at first, but ultimately won its way to the forefront of popular esteem. The famous "La donna e mobile," already referred to, made an instantaneous hit, and was long hummed and sung and played to boredom in every quarter of the globe. To make quite sure that the public should not get wind of this arresting melody before the night of the performance, Verdi did not put it on paper until within a few hours of the time when Mirate, the tenor, had to sing it. Soon all Venice was mad over it; and the men, they say, sang it in the streets into the ears of the women. The opera was heard in Paris in 1857, and was received with great applause. Some years before, a French musical journal declared that it was "the least strong" of Verdis works, and that it had "not the slightest chance of maintaining itself in the repertoire." It is a safe dictum never to prophesy unless one knows! 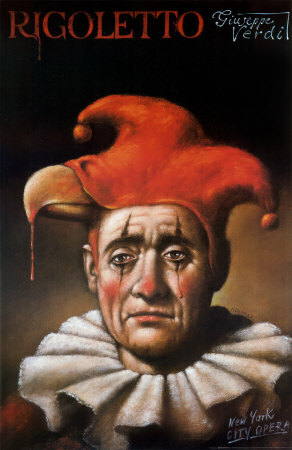 In this haunting and surrealistic poster, Rigoletto is seen wearing a red devils hat and crying tears of blood. This poster was designed by the famous Polish poster artist, Rafal Olbinski. It was commissioned by the New York City Opera. Size: 24 in. x 37 in.